Eleven months into his job at district director of the Nevada office of the Small Business Administration, Joseph Amato has been impressed with Nevada entrepreneurship and plans to launch a $225 million fund to provide venture capital to burgeoning companies and keep them from leaving state. 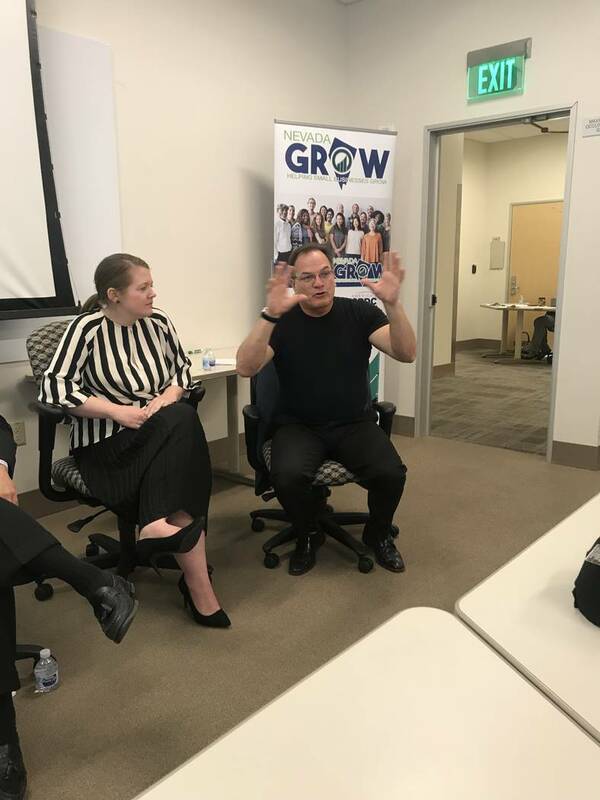 Left, Erin McDermott, director of lending partnerships for Accion, and Joseph Amato, district director of the Nevada office of the Small Business Administration, talk about funding local small businesses. 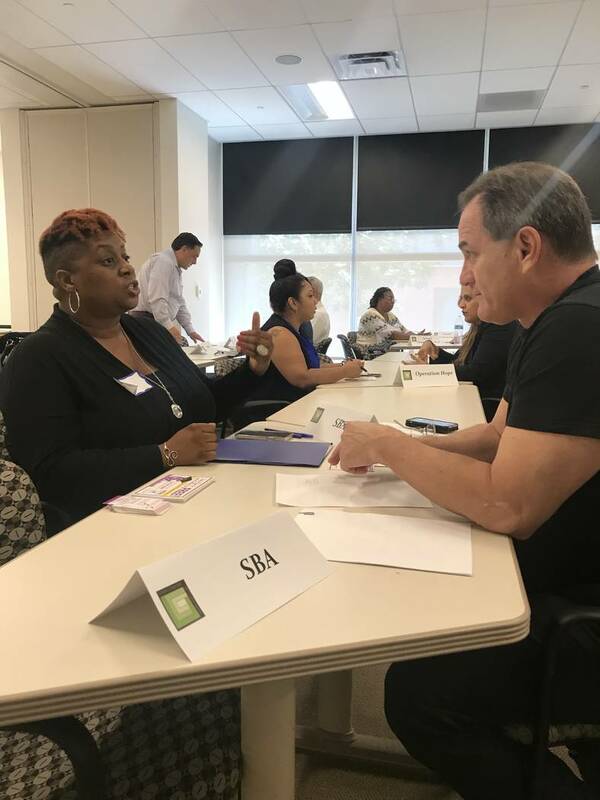 From left, Rhea Watson, owner of Scholarship Solutions, and Joseph Amato, district director of the Nevada office of the Small Business Administration, discuss finances. It’s called a Small Business Investment Corp. utilized in other states, and Amato said he’s deemed it a priority for the state and hopes to set one up within a year. He spoke of his plans for the SBIC at ending conference sponsored by the Urban Chamber of Commerce. An SBIC allows the SBA to get involved in venture capital and private equity, Amato said. He’s in the process of putting together $75 million in private funds that will be matched two-to-one by the SBA to create $225 million. Amato said he sees businesses on a daily basis that need between $10 million and $20 million.Unlike traditional lending, venture capital goes after projects that haven’t generated any revenue, Amato said. Private equity goes after companies with track records of cash flow and a proven product or service, he said. That capital is needed as SBIC’s in San Diego, Los Angeles and San Francisco troll Nevada for companies looking to steal them away to California, Amato said. Most venture capital is going toward companies involved in research and products that are globally based, Amato said. The fund would serve companies like one looking for private equity for its creation of a new mechanism for aircraft to move on the ground, Amato said. That company needs $25 million for global distribution. There’s a private data management company looking for $20 million for its proprietary product on medical information that will help them become a global entity, Amato said. In his 11 months, Amato said he views the Nevada economy development as “in its infancy in terms of opportunity and growth and what it could be” just as its neighboring state of California continues to become harsher for business. Northern Nevada has the technology companies moving there, Amato said. Southern Nevada has medical and data research industries growing from stage one to stage two with eight more stages to go, he said. Nevada has come a long way in its recovery since the start of the Great Recession a decade ago and continues to have an entrepreneurial spirit, Amato said. Startup density levels in the U.S. have been about 20 percent lower than before the Great Recession, according to a report from the Kauffman Foundation. Despite that trend line nationally, the reports showed that in 2017, Nevada ranked No. 1 in the country for startup activity among the 25 smallest states and No. 1 when all states were combined. California was No. 1 for the largest states, followed by Texas, Florida and Arizona. In Nevada, 410 of every 100,000 people become entrepreneurs every month, the 2017 report said. Only five states have higher rates, including California. Nevada leads the nation with 108 startups per 1,000 businesses, twice as many as West Virginia on the lower end. Utah also fared well behind Nevada among smaller states. According to information provided by the SBA, 2,429 establishments started in Nevada in the third quarter of 2016, generating 9,034 jobs. In the same period, 2,264 businesses exited, resulting in 6,970 jobs lost.The number of proprietors in 2016 increased by 2.5 percent in 2015. That quarterly startup number just surpasses the number created in the mid-2000s prior to the recession. It dipped to about 2,000 a quarter after the recession when closures surpassed startups for about three years during the recession. Amato said in all the businesses he has visited since he came to Nevada, 11 months ago, he estimates only 18 percent know the SBA exists and can help them. In essence, the SBA has been “irrelevant,” to many of them, and Amato said he wants to change that. The SBA has two programs, one a loan guarantee that ranges from 75 percent to up to 90 percent for loans up to $5 million. It also has a loan program for fixed assets such as commercial real estate and equipment. Amato said one of his focuses at the SBA, which has offices in Las Vegas and Reno, said is not only providing a higher level of service, but reaching out to minority communities that have been underserved. As an entrepreneur, your approach for asking for money should be secondary for what you are trying to achieve, Amato said. It’s about pursuing something you are in love with rather than only being about money. That way lenders know you are invested in what you’re doing, he said. “You got to love what you are doing or the first time it gets hard, you will bail,” Amato said. He said he plans on rolling out a program on “banker speak” to better educate borrowers on what bankers are talking about. The algorithms on Facebook are more complicated than what a banker does to make a decision, Amato said. Some 80 percent of a bank’s decisions are done by computers. It’s about hitting parameters such as credit scores for one, he said. In talking to businesses on a daily basis, one of the problems he learns is they are talking to the wrong banks about what they need, Amato said. If someone wants a restaurant loan, they shouldn’t go to a bank that doesn’t do them. The SBA is a small cabinet agency, but Amato said he tells people on Capitol Hill how important it is. Small businesses make up 80 percent of businesses, and that help drives the economy, Amato said. In 2016, 55,446 loans under $100,000 (valued at $744.3 million) were issued by Nevada lending institutions reporting under the Community Reinvestment Act. There are more than 254,000 — nearly 72,000 minority owned — small businesses in Nevada, according to the SBA in its 2018 business profile that dates to 2015. They employ about 475,000, about 42 percent of the state’s employees. In the latest data available, companies of fewer than 20 employees completed more than 15,000 jobs. The median income for individuals self-employed at their own incorporated businesses was $50,174 in 2016. For individuals self-employed at their own unincorporated firms, this figure was $22,344, according to the SBA profile. Accommodation and food services are the leading employers of small businesses followed by healthcare and social assistance, construction, administrative support and retail.